First floor additions are common for living spaces such as family rooms, sunrooms, dens, and kitchen bump outs. If your home has a basement then you have the option of expanding it by including a basement in your first floor addition plans. 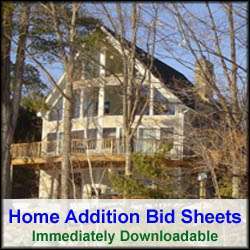 This said, adding a basement to your first floor addition plans adds significant expense and complicates the project. When I’ve built first floor additions, I’ve elected to either go with a crawl space or simply a slab foundation. To save on costs and hassles when building a first floor addition I highly recommend going with a slab foundation if at all possible. This said, a foundation solution for the house addition should be selected that ties in aesthetically best with the existing home. For example, I used crawl space foundations in a couple of my first floor additions to match the base of the addition with where it tied into the existing home. There are two additional benefits of including a crawl space foundation in your first floor addition plans. Though not a complete basement, the crawl space does afford some storage benefits. In addition, it’s less expensive to construct then a full blown basement since there is less concrete required. Though I’ve built all of my first floor additions with wood lumber, alternatively you can consider concrete block construction. Up here in New England you rarely see concrete block construction, however I have seen at least some crawl space foundation walls constructed out of concrete block. Concrete block construction for first floor additions is more commonly seen down south. Often when planning a first floor addition homeowners focus on the size of the addition and the interior space. Though these are important considerations they need to be balanced with the exterior aesthetics and how the home addition ties into the existing home. The first floor addition should be sized proportional to the existing home for example. In addition, it’s key to match the exterior siding to the rest of the home. 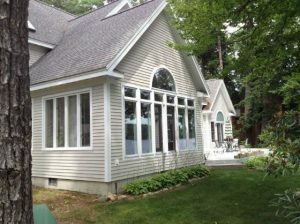 For example, you don’t want to have a vinyl sided addition while the rest of the home is wood clapboard. If on the other hand the main part of the home has brick facing, then using wood or vinyl siding on the first floor addition can work, if the right colors are chosen. For example, you want to make sure to use the same size and style windows on the first floor addition if they are to be visible with the other windows on the main house. Also any window grille work should be the same. Similarly exterior door selection should be the same, or at least complement the rest of the home. Roof design is also a major consideration with a first floor addition. It’s important that the home addition roof meld in well with the existing home, whether it be melding into an existing roof line or abutting an exterior wall of the main home. The three main types of roof designs to consider are shed, hip, or gable. Use the roof style and roof pitch that best melds into the existing home. Also, make sure to select roof shingles that match the existing roof shingles of the home. If the first floor addition’s roof is attaching directly to the main roof you may have no choice but to shingle the entire roof, room addition and main roof, to prevent any type of visual shingle seam. When considering flooring for your first floor addition, keep in mind that carpeting is probably your cheapest solution. Wood flooring and ceramic tile flooring will cost quite a bit more, but it will look better, it’s easier to maintain, and future potential homebuyers will value it more than the carpet. Another major concern when building a first floor addition is the home’s heating and cooling system. Often when building a first floor addition the existing heating and cooling system will be insufficient for the increase in living space. 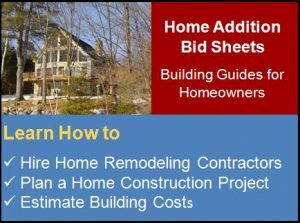 You may have to include in your home addition budget funds for installing a larger heating/cooling system, or alternatively installing supplemental heating and cooling in the home addition itself. Finally, in regards to electric, depending upon the size of the first floor addition you may need to add 1 to 3 more circuits to the electric panel. Check to see if the existing main circuit panel can support the additional circuits. If not, you’ll need to either put in a larger main circuit panel or install a sub-panel. 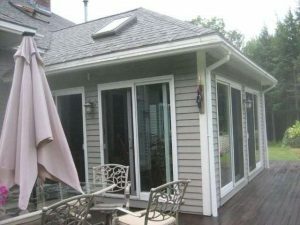 By keeping these key first floor addition topics in mind during the planning process of your project you should have a much better chance of achieving a functional and aesthetically attractive addition.